The main qualities we look for from our applicants are a high level of academic achievement and a clear aptitude for research. 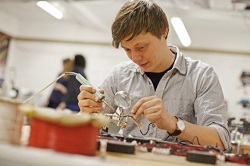 You should normally have an MSc in a discipline relevant to your proposed study - this is usually Electronic Engineering, Computer Science, Telecommunications or Physics but Mathematics, Philosophy or Psychology may sometimes be just as relevant. Exceptions to this requirement may be made where you have particular qualifications or additional experience. If English is not your first language, you will need to achieve a minimum score of 6.5 in the IELTS test, including a score of 6.0 in the academic writing module. You may also provide alternative qualifications instead of IELTS and can find full guidelines of accepted qualifications on our college pages. For entry requirement for the Media & Arts Technology (MAT) programme, please see the MAT site.